You can use this form to ask a question or share a thought with the Graduation to Certification program. If you would like to join our mailing list, click here. I am a novice interpreter interested in resources to support my professional development. I am interested in serving as an interpreting mentor or language coach. I am connected with an interpreting agency interested in hosting an apprentice or interested in materials for supervision. I am an interpreter educator or a researcher or academic. What training and experiences do you have with mentoring or language coaching with interpreters? How does your agency onboard interpreters who are recent graduates? What program or institution are you affiliated with? What generated your interest in the GTC program? How did you hear about the GTC? 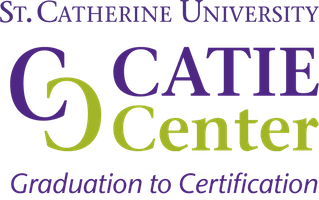 The CATIE Center at St. Catherine University, Graduation to Certification project is funded by the US Department of Education, Rehabilitation Services Administration, #H160C160001. Although the contents of this web site were developed under a grant from the Department of Education, they do not necessarily represent the policy of the Department of Education, and you should not assume endorsement by the Federal government.